I love them. I love to knit them, I love to give them as gifts, I love to wear them, but most of all, I love to design them. The shawls in this collection have a romantic feel to them – a little lace here, a soft ruffle there, a new shape, a different texture. I’ve added some different lace styles to give you a feeling of Shetland, Estonian and other traditional lace styles. The pattern names are a tribute to Georgette Heyer, an author to whose romantic comedies I have spent many enjoyable hours listening while loom knitting. This sweet little shawl has a rather unique “square back” shape. The neckline curves nicely to hug your shoulders and stay in place. The pattern is written for 64 pegs, but you may make this any size you like. The photo shows the shawl made on a 3/8 inch gauge loom, but larger gauges may be used. The shape is particularly well suited for graduate dyed yarns that are done with matching ends – where the color repeats are 1 2 3 4 3 2 1. You may see these skeins sold for making matching pairs of socks, sometimes as two skeins, or one large skein. There is an option for adding beads to the center lace column. The edges of Bath Cotillion treat you two different types of lace work side by side. Together they make a striking complement to a simple garter stitch shawl. Bath Cotillion is particularly nice when two yarns are combined – one in a solid neutral color, and one in a variegated pattern. The neutral yarn helps tone down the variegated pattern, making a softer combination perfect for a romantic shawl. Bath Cotillion is made on a 3/8 inch gauge loom with 78 pegs, but a 1/2 inch gauge may be substituted. Cousin Kate is fun little shawlette with a bit of a difference. The shaping is not the usual triangle, but a square backed shawl that hugs your shoulders, framed by a soft, romantic ruffle. Want a larger shawl? No trouble, just add yarn. Want a wider shawl? Just add rows where the pattern tells you. Have a gradient dyed yarn? This is the perfect pattern. Try a larger gauge loom, a heavier weight yarn – Cousin Kate will love it all. The photos show the pattern made on a 1/2 inch gauge loom with 45 pegs. 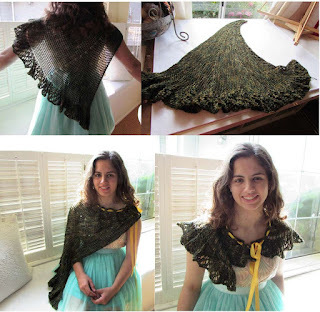 This sweet crescent shawl has a border of pretty lace medallions. The crescent shape dips low on the back with a gently rounded center. I've written the lace steps by step, line by line. Leonie is made on a 1/2 inch gauge loom using 55 pegs. This elegant wrap takes its influence from Shetland Lace designs. One of the joys of this type of lace is that you may make the pattern in yarns from lace weight to worsted. Traditional Shetland Lace is made with the lightest possible yarn. The pattern uses a 3/8 inch gauge loom with 62 pegs, but you may increase to a 1/2 inch gauge for a lighter, more traditional Shetland shawl. This large circular cape features a wide collar and beautiful panel inset in the back. The shape combines the best of a half-pi shawl with Faroese shaping. While Venetia is beautiful when made in two colors, it is also easily made in just one. Venetia is made on a 1/2 inch gauge loom using 74 pegs. 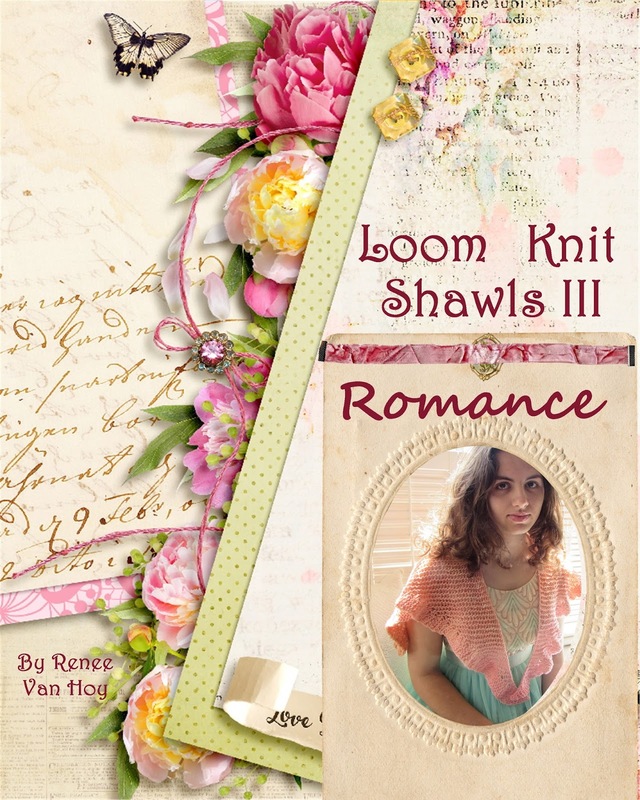 “Loom Knit Shawls III: Romance” e-book comes with two .pdf files, a large print (24 point font) version, and a paper-saver (12 point font) version. It is screen reader and tablet friendly. 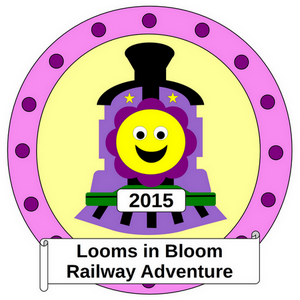 Also included are diagrams of all six patterns, and a full photo gallery.